Zoe Faust is not who you would think to look at her. By appearance, she is a 28-year-old woman. In reality, she’s walked the earth for 300 years. She is not a ghost. Not a zombie. She is a living, breathing person, turned immortal through alchemy. She has made a good life for herself, but the struggles of living forever are hard to hide in a world populated by regular humans. But then Portland artist Logan Magnus is killed, and Zoe is thrust into a world of art forgery, betrayal, and alchemy just when she is beginning to feel at home in present-day Portland. She has found love with policeman Max Liu, and is settling into a home with her best friend, Dorian. Granted, Dorian is an almost-150-year old French gargoyle who must hide in the attic from prying eyes, but he is a lovely person, and a passionate chef. Now a local artist has been murdered, and Zoe is blamed for the crime by his grieving widow. Zoe has also found her mentor, Nicholas Flamel, who must be freed from a painting in which he has been trapped through the magic of alchemical painting. With the help of Dorian and Tobias, another alchemist Zoe has known for many years, and the present-day people around her who have no idea what’s actually going on, Zoe must sift through historical accounts, layered conversations, and varying accounts of witnesses to find the truth. 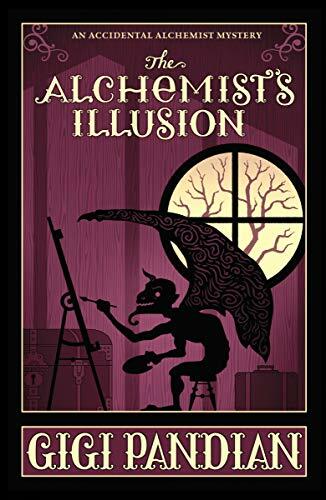 The Alchemist’s Illusion is filled with beauty. The study of alchemy, from the use of paint and art to the magic and gold it creates, holds many secrets and mysteries. Zoe and Dorian also enjoy their food, and the vegan recipes at the end of the book are the culmination of a book filled with gorgeous and delicious descriptions of meals and snacks. But ultimately, the beauty that flows through the book comes from the love and affection between Zoe and her people. The kindness, concern, and gentleness expressed are warm and soothing, and no matter what is happening in the story itself, that loveliness carries the overarching theme to its conclusion. Pandian paints a lovely picture of relationships throughout the book’s mystery of greed and violence. We would all be so lucky to find that circle—and that time— in which to live.